What Are You Wearing To The Revolution? It was never the point of this blog to sound off about politics. 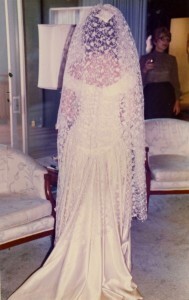 Like the First Amendment, I believe in a separation of style and state. My political opinions have nothing to do with my views on the latest skirt lengths. Further, fashion should not be dictated from Washington. Have you seen what is considered ‘fashionable’ at a political assembly? 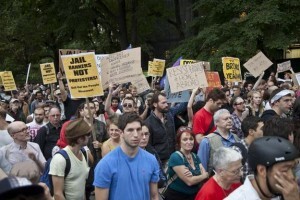 I think about this as I watch the “Occupy Wall Street” protesters walking through the streets with their picket signs. My thought is, “what if we dressed-up for the revolution?” If we showed up in slim pants, a boat-neck fitted top, a tailored-trench coat and a pair of kitten heels (this is a revolution, those 5” stilettos will only make it through the first half mile) would we be taken more seriously? Would our elected officials look at the protesters and see their voting public and then listen instead of shaking their heads at the mob of demonstrators and mutter the word, slackers, under their breadth? 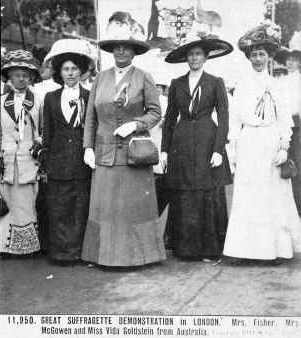 The best dressed revolutionaries just might be the Suffragettes (1900-1920). 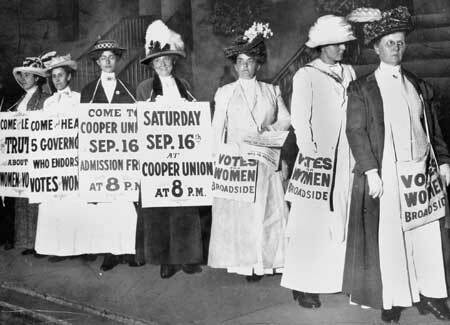 They demonstrated in the latest fashions of the time and the accomplishment of that fight was the passing of the right to vote for women, the Nineteenth Amendment. Madison Avenue has made many claims to women…wear a certain fragrance and no man will be able to resist you…use a special cream every night and in 30 days you will be mistaken for a woman in her 20s. I read them with a smile on my face thinking, “oh, if only it were true.” These ads are so prevalent I barely notice them anymore. When I see a picture of an 18 year old model claiming the reason her skin is so youthful looking is because she uses a special cream every day, I roll my eyes. My guess for her youthful skin is she is youthful! But why let the facts get in the way of a good ad campaign? 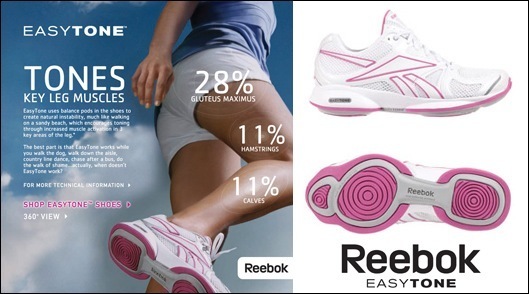 Remember MBT sneakers and now Reebok Easy Tone sneakers? The manufacturers claim you can lose weight just by wearing them. No exercise required. Here is how they work; since it is difficult to balance in them you work harder at standing and walking, therefore, as you tighten your muscles you are burning more calories (walking + difficulty balancing = accident). Now we have Lytess—the first multi-tasking fashion legging. The claim from Lytess is that by wearing these leggings all day and all night you will drop inches. The claim further states the reason this works is because these leggings are manufactured using caffeine and shea butter. My guess is if you wear these leggings day and night, you are in a perpetual state of sweating which means you will need the aforementioned fragrance because in those leggings you will be resistible! 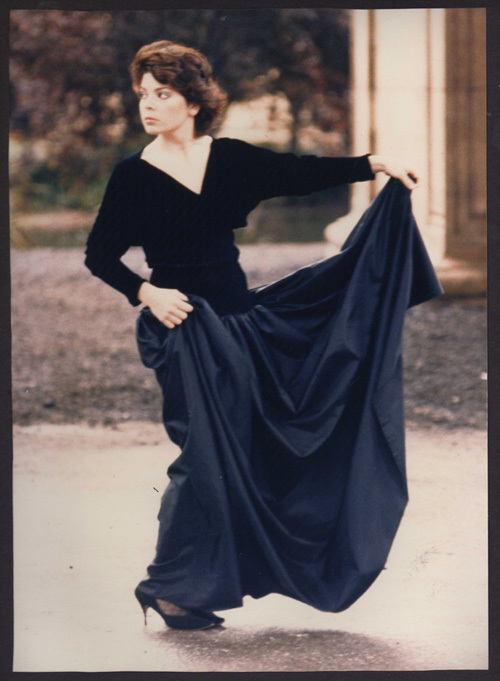 I was 15 when I began experimenting with clothing design. I would spend my afternoons shopping for fabrics and my evenings constructing bright floral pants and shiny tops. That is where it began and ended for me as I understood the impracticality of becoming a designer. A career in such a fickle field seemed impossible as it did not offer the security of a future in more distinguished fields ; -) However, this did not discourage me from dabbling in my creative urgings. I made my own clothing, got a job at a super groovy boutique and poured over fashion magazines. As my fascination with design evolved so did my need to see my clothing on other women. I was not part of a posse of women in high school or college but I do have four sisters. They gave me the audience I needed to indulge my need to design. 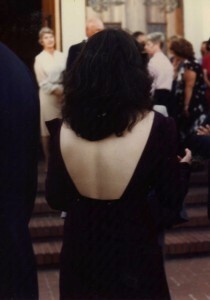 Anne, the most conservative of the four, permitted me to design a dress with no back. She heroically wore it without a bra. Theresa wore the first strapless dress I designed. The dress would not stay up on its own so I did what I thought all designers did, I taped her to her dress. If the dress began to fall, we would run off to the bathroom and re-tape it. 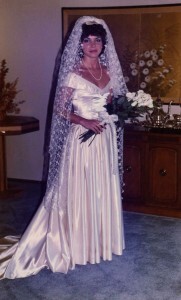 Lisa was stunning in the first wedding gown I designed. Luckily for her my tailoring skills had vastly improved and we no longer needed a glue stick to keep her dress up. Ella indulged me the most. 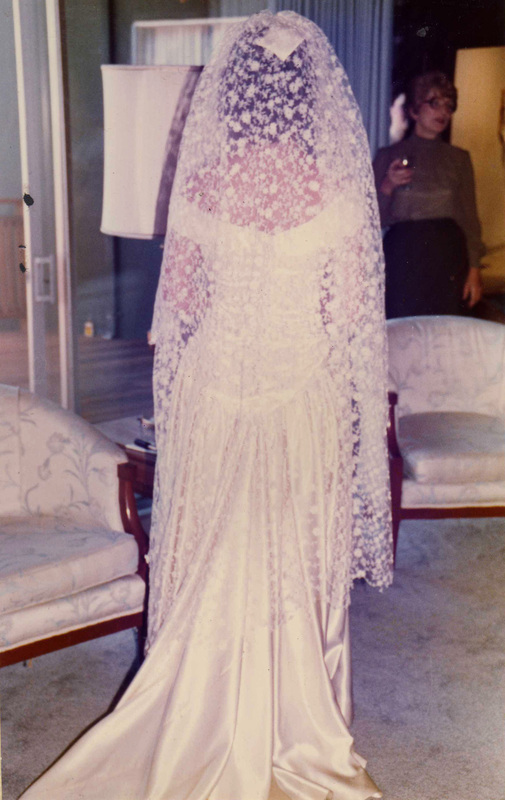 She posed in my gowns and dresses that would only be seen through a photographer’s lens. 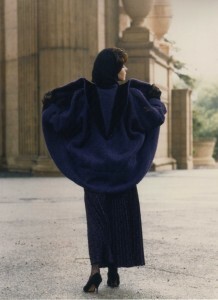 The year was 1982 when I photographed my first collection.